The idea: Rita Barrett, CI Spanish Teacher Extraordinaire, told me about her children’s book project a few summers ago. Her kiddos write books and they take them on their class mission trip to the Dominican Republic during Spring Break. There was actually a purpose for writing a children’s book: so a child learning to read would get to pick out their own book! Although it still cost her a good amount of time, the end result was worth it, she assured me, because her students worked so hard on their books. It was more than a project and a final grade: it was an act of service. YES! I loved the idea but I had to figure out how to make it work for me and my little darlings. I don’t take my kids on a class trip…BUT…. I am connected to an orphanage in Mexico that I volunteer at every summer. 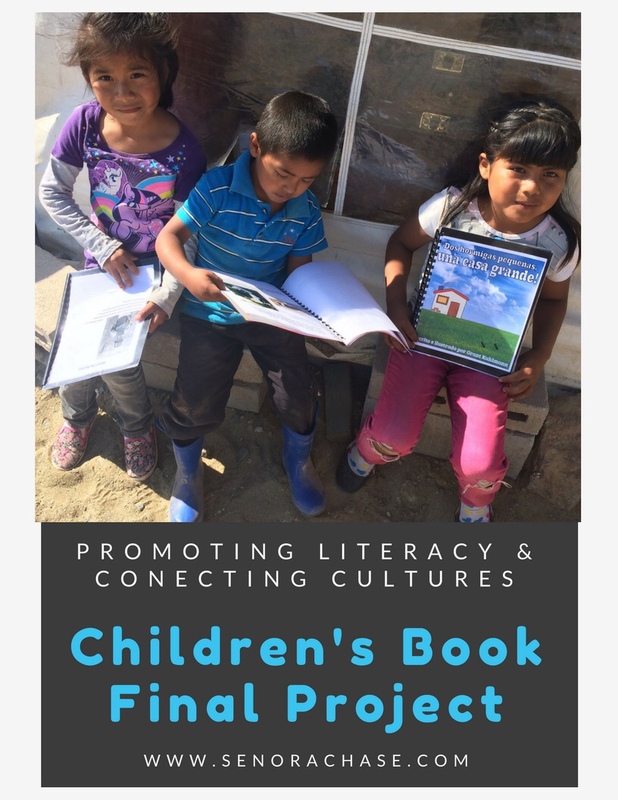 The wheels started turning…I had this incredible opportunity, not only as a outlet for my children’s book project, but a chance to make Spanish class more than just acquiring a language and earning a grade. I had a dream of connecting my students to real life people…really, isn’t that what “teaching culture” is all about? Not to mention promoting literacy south of the boarder. Now the Nitty Gritty: While I tell my Spanish 2s about this at the beginning of the year, and I have pictures hanging in my classroom, we don’t get started until the end of March. There are a lot of parts to this project, to make sure we’ve got a quality project to send down to Baja. If you would like to edit any of the documents below, just make a copy and you’ll be able to adjust it to work for you and your little darlings. Disclaimer: I do this only with my Spanish 2s, so we’re talking 60 books every year. I’d love to do it with all my levels, but 180 books sounds too daunting at this point in my life! Project Guidelines: Here’s the overview of the project and the guidelines like page limits, expectations, due dates, etc. Brainstorm: Before they begin writing, I want to help them consider a few ideas before they commit to one. On this sheet they consider three ideas. For kiddos who have a hard time coming up with anything, I suggest that one of their ideas should be their favorite movie growing up and one should be a story about their pet. This usually helps gets their ideas flowing. I ask my kiddos to write this in Spanish, because if they can’t get that part down in Spanish, they won’t be able to write the whole story in Spanish! Rough Draft Sheet: My biggest concern about this project is I want to see what THEY can write! Not what Google can translate or what their Aunt who’s a Spanish teacher in Michigan can do. It is just too tempting to type it in English and translate it for my little darlings, so I have them write their entire rough draft in class. I give them 3-4 chunks of class time to work on their rough draft. (I teach about half the class and they work for the other half…whatever they can’t finish in the allocated time, they must come in a lunch or after school to finish hand writing it before they can take it home to type it.) I love watching them work on their rough drafts, observing them answering each other’s questions and getting to coach them along. Student: Sra. Chase, how do you say “he fled”? Me: You know how to say, “he escaped” would that work in your story? Typing in Spanish on Chromebooks or Typing in Spanish at home: Students who finish while they still have in class time can start typing on our class set of Chrome Books. Ideally they work quickly on writing their rough draft so they can type it in class. Here are instructions for changing the keyboard language on Chromebooks or if they’re typing at home, instructions on typing accents. Editing Sessions: I used to collect all their rough drafts, spend hours fixing their mistakes so their final books would be error free. It took a ton of my time and it wasn’t super effective- still there would be mistakes that they didn’t change or I would spend way too long trying to figure out what they were trying to say. Rita told me the secret to a successful book project is sitting down with each kid to edit it together. I was hesitant, because ummm…who has that kind of time?! But Rita has never led be astray before so I trusted her and took the leap and I’m delighted with the results. In the Editing Sessions document, there are 2 different sign up sheets. At the end of the document is the “In Class Editing”- as soon as a student finishes handwriting their story and types it up, they can sign up for “in class editing”- While everyone else is still using class allotted time to work on their rough draft, I sit down with those students and we take care of the editing in class. I just go down the list and check them off as we go. Students are motivated to use their time wisely so they won’t have to sign up for “outside of class editing”. In addition to class allotted book time, I also will edit with students during their unit exam and during Free Reading and any time I can carve out during the day. I aim to edit about half the books during class time. The rest of the students have to sign up for “out of class editing”- I figured out the time slots that work for me and kids sign up for what works for them. This has actually turned out to be easier for me: Nothing to take home and correct on my weekends! And I really like sitting down with each kid and editing it together. It’s personalized Grammar Pop Up Central! OK, so since we’re talking about a woman, do you think this should be UN or UNA? Did he yell that just once or is it something he always yelled? So should it be gritó or gritaba? To make it go faster, I have kids share their doc with me, I open it up on my computer and I make the changes as I ask them questions. (It’s waaaaay faster for me to add a missed accent!) Once we finish I know their story looks good and then they’re free to work on their illustrations/photographs/ screenshots, whatever). Editing Rubric: After I’m done editing with a student, I fill out this rubric quick. Easy Peasy! This has been heavily influenced by Scott Benedict’s Quick Write Rubric which is awesome and if you don’t use it, you’ll be happy to find it! Then students work on putting together their book at home. They give me their full color cover and “About the author” page with a picture. We glue stick these to card stock and laminate them to create the front and back covers. When their whole book is complete, our Librarian lets me use the binding machine (you can get the plastic spiral spines at Office Depot or online). Final Book Rubric: When students turn in their final books, it’s easy to grade them because all the hard work is done. Just flip though and marvel at their creativity. Before I pack them up for delivery, we spend a bit of class time reading their classmates books, FVR style. But wait, there’s more: Then, during the summer I have the incredible privilege to spread the books out and invite my Baja Friends to pick out their favorite. I try to take pictures of them with their new book and I send them to my students over the summer with a note thanking them for their hard work and assuring them that their book has found a good home. That’s the best part…my little darlings get a picture of their little buddy reading their book. When school starts up again in August my former Spanish 2s stop by to tell me the picture is on their dresser or bulletin board or whatever. And it makes me really happy to think that Spanish class is more than a credit: it’s a way to bridge cultures and connect people. Previous How do you know if you’re comprehensible? I love the way you have broken the project down. Getting it into manageable chunks is the key to success. I am going to adapt your storyboard and rough draft documents for my project. Those are some middle steps that are missing from my process and I can see how they will really help. We are editing books this week! I love the 10-15 minutes of individual time I have with each student and the pride of accomplishment when they can share their stories with others. This is an incredible project!!! I’m absolutely going to do this next year, thanks for the idea!! I definitely want to use this as part of my final project. However, I would like my students to get their books professionally published. Do you know of a site that publishes single copies at a lower cost? That sounds cool. No, I don’t know where you could do that. If you find a neat resource, please let me know and I’ll link it to the post.